Livni reveals past government discussions to target Lehava group; activist slams 'Soviet' crackdown on legal organization. Former Justice Minister Tzipi Livni, whose Hatnua party recently merged with Labor, voice her approbation on Tuesday of the nighttime arrest of ten members of the Lehava anti-assimilation organization over charges of "incitement" - charges which the group strongly denies. Livni on Kol Yisrael radio called "to uproot those who fan hatred and violence and incite to racism." She revealed discussions had been held in the past to pave the way for targeting the heads of the organization, which is led by director Bentzi Gopshtain, and making it illegal, stating "they have no place in Israeli society." The admission of discussions trying to silence Lehava confirms accusations by Gopshtain that his organization has been targeted in a coordinated, ideologically-driven "delegimitization" attempt, which comes despite the fact Lehava operates completely according to the law. On Tuesday Gopshtain and the other activists are to be brought for a hearing on extending their arrest, with police demanding an extra ten days. 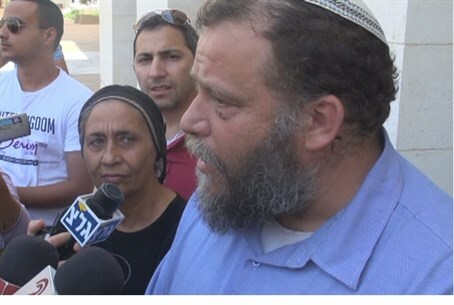 Their lawyers, Attorneys Itamar Ben-Gvir and Avichai Hajbi, stated: "the request to extend the arrest of Lehava members by ten days teaches more than anything about the goal of the request and the hysteria and panic in the police. They ask for ten days in murder cases." On another topic in the interview, Livni refused to apologize for calling Prime Minister Binyamin Netanyahu "a zero" and "trash" on a TV program, saying "it's a satire program - to take jokes and put them into a sentence and translate it as if I said it in an interview - that isn't right." She also refused for saying crass curses on the program, including rude swear-words in Arabic. The crackdown on Lehava comes after three youths who are members of the organization were arrested on suspicion of setting fire to a bilingual Jewish and Arab school in Jerusalem and scrawling racist graffiti. According to the indictment submitted against them on Monday, the three decided to do so after learning the school held a memorial honoring the terrorist leader Yasser Arafat. Speaking about the Lehava raid Monday night, former MK Dr. Michael Ben-Ari, a close friend of Gopshtain, stated Tuesday that "the violent and aggressive arrest of Lehava members is another action in the history of the left - those who let the Islamic Movement in Israel incite openly for the destruction of Israel. They are acting with shady tactics against an organization that works against assimilation." "This is a vain attempt to repress an organization that legally and transparently works on one of the most painful topics today in the state of Israel," said Ben-Ari. He argued the tactics of arresting organization members in a night raid over the tangential connection to the three suspects was a pretext to crackdown on their anti-assimilation ideology, charging the left of "finding an opportunity to libel Bentzi and other activists with plots in the Soviet Russian mold." Ben-Gvir, who represents Gopshtain and the other arrestees, noted that only yesterday, one of the detainees stated that he was offered money and leniency by the ISA for information that could lead to Gopshtain's arrest. "The politicians, the left, and the police operate against Lehava, while it is clear to them that this is a valid organization which operates openly against assimilation," Ben-Gvir fired. "It's a shame."